*by inspiring 400 schools to perform well above 2000 peace actions reported to the Life-Link interactive website. One of actions is named: "From a Culture of Violence to a Culture of Peace/Care". The peace actions involve students, teachers, parents and community officials. Life-Link in 1998 invited schools world-wide to propose short-time peace actions that could be performed at and around their schools. The result was 1500 proposals from 179 schools in 55 countries. These 1500 proposals, many overlapping, are since year 2000 fused and edited into a manual including 60 peace actions, each action with concrete guidelines on Theory, Activities to be performed, and Step by Step preparations. A summary of the Life-Link programme is enclosed to this report. Part of the Life-Link Friendship-Schools progress facing the Culture of Peace decade has been to formulate a clear and useful definition of "Peace". 1. Peace must be taken to the level, the perspective and responsibility of each individual. 2. Peace is basically a question of constructive and caring relations and behaviours. 5. Promotion of a Culture of peace requires skills in project management: Lets get Organised. Language of "Pro-" instead of "Anti-" or "Non-". Life-Link has made efforts to formulate our program with proposed peace actions into Pro-actions, thus advancing the cognitions in favour of solutions rather than to be stuck in protesting and "Non-" formulations. This has an important theoretical base in behavioural psychology - the human mind favours positive pictures and "visions". A message of "Non-Violence" will thus by the brain rather be visualised as "Violence". As an example: Life-Link proposes Constructive Collaboration instead of Conflict Resolution. Almost 400 schools in more than 60 countries use the Life-Link programme. Slowly increasing in number, nearly 400 schools in 60 countries all continents today use the Life-Link Friendship-Schools Programme and manual for peace education. Classes perform short-time peace actions inspired by the 60 proposed "peace actions" and then report to the Life-Link website. More than 2000 peace actions have been reported since year 2000. The Life-Link website includes the Life-Link programme and manual, peace action reports from schools several with photos (Schools & Actions), Conference reports, A chapter on Project Management, some references on organisations and other peace programmes. The webmaster is a brilliant young man from Romania 20 years old! Life-Link, although a Non-Governmental Organisation, has made progress in contacts and collaboration with Governmental Organisations like Ministries of Education and Ministries of Youth. The Life-Link ethics and working manual in English language is now translated into Russian and Arabic in collaboration with governmental departments, and into Spanish in collaboration with a community department in Argentina. International conferences now in strategic countries and regions. 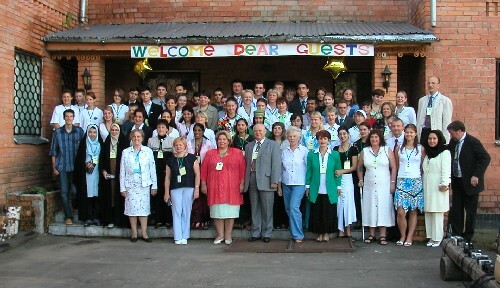 Eleven international Life-Link conferences since 1989 have given feed-back to the Life-Link programme. The first nine conferences took place in Sweden, conference No X took place in Bratislava, Slovak Republic, and conference XI took place in Moscow, Russia. The conference No XII will take place in Alexandria, Egypt November 2005. Conference No XIII is planned for Amman, Jordan, and an offer to hold a future conference has been given from Iran. China will be approached for a future conference. Life-Link exchange programmes between Sweden and Russia as well as Sweden and Ukraine are today free from visa costs, thanks to informal agreements. Teachers time and credits for working with schools&#8217; international programmes. Teachers that are in contact with the Life-Link programme have told us that they have little time within their official working hours to engage and promote peace and international programmes. Nor have they any official credit while engaging in such work. On the contrary, they confess that there is scarce interest from the other teachers at their schools to know and to learn about peace education experiences like the Life-Link campaigns or the Life-Link conferences. The Life-Link programme was initially limited to British English language in order to be an extra tool for participating schools language training and cross curricular collaboration at the schools. We have learnt that certain cultures still need their own language in order to make the Life-Link programme available for the big majority of schools. The Life-Link manual with peace actions guidelines has thus in collaboration with educational institutes been translated into Russian, Spanish and Arabic languages. The young Life-Link webmaster from Romania has also constructed a programme available on the Life-Link website, making it possible to produce more translations. Life-Link, as most voluntary peace programmes, works with financial and staff restrictions, and on a "year to year" budget. It is still not possible to ask participating schools for any compulsory fees, such a demand would exclude most of participating schools and youth. Each participating school pays for their own expenditures while performing local peace actions or travel expenditures to Life-Link conferences. Access to computers and Internet is still an obstacle in developing countries, even though we experience promising progress during the recent years. Life-Link stresses the importance of good Project Management skills during planning and performance of proposed short "peace actions" at and around schools. Life-Link offers a special chapter within the Manual Guidelines and on the website on this topic. Specially proposed peace actions in favour of Project Management training are introduced within the Life-Link fourth theme: Lets Get Organised. Life-Link still recognizes a need for project management training at many participating schools. Logical and/or Emotional approach to a Culture of Peace? The Life-Link programme operates in a decentralised manner, with an international office in Uppsala Sweden, and activities taking place at schools world-wide. The office works mainly with voluntary 1-2 people staff, plus one paid part time secretary. The schools do not receive any financial support from Life-Link Sweden, but performs the peace actions either as part of their school curriculum, or fundraising locally for extracurricular actions. International conferences gather small school delegations from the most active Life-Link schools in order to report and discuss peace actions and to make the programme and campaigns better. This is the core activity of the Life-Link programme, short-time ("2-hours") peace actions tanking place at and around schools. "Learning by doing" and "Act Locally and think Globally" are well-known slogans that fit well with the Life-Link Peace actions. Schools performing and reporting on a minimum of four peace actions per year receives a Cartificate. Students have an important influence on the Life-Link programme and campaigns: Constructive collaboration! Building the future! Let´s do it! Teachers and educators gathering at Life-Link annual international conferences discuss the Life-Link Peace Education pedagogics. C) Education is fundamental in any society and R) must be given the highest priority. C) The conference endorses the UNESCO Recommendation on International Education 1974, revised in Geneva 1994. R) Education must include vital topics like Human Rights, Democracy, Environment and Sustainability. C) The success of School-Twinning and School-Networking programmes across borders depends on students and teachers working together in equal partnership. R) Young people should be given every opportunity to empower themselves through initiating, creating and running youth projects. C) Teachers are crucial in order to promote and support the youth activities. R) Teachers at each school should be given time and necessary facilities as well as encouragement and professional support in order to successfully accomplish this mission. C) School-Twinning is when youth and teachers at schools in different countries or regions decide to created a partner-schools relation. School-Networking is when several schools cooperate around common concerns or in a common campaign. A partner-schools programme will stimulate youth contacts across borders, leading to increased self-esteem and understanding of others points of view. Such a programme will also promote intercultural learning in a "global classroom", community interaction and responsibility and reverence for Life on Earth. R) Youth communication and cooperation through school-twinning and schools-networking should be actively encouraged in every school. We recommend that Education Ministry policy supports the concept of School-Twinning and School-Networking, and also the activities of the Non Governmental Organisations associated with education. C) Partner-Schools and School-Networks need concrete projects and campaigns. R) Each school should run at least one project or participate in one global cross-border campaign every year. C) Education aiming at increased global understanding, including school-networking around vital issues for our common future, has an increasingly important role for individual and global security. R) We thus recommend, also for this reason, that mandate is given to schools to introduce school-networking into the schools curriculum. C) Improved information and communication technology equipment is beneficial in international school-networking. We stress that human communication and conflict resolution skills can be enhanced by technological innovation. R) It is the responsibility of countries&#8217; educational departments, the international community and of each school to introduce technical devices and the necessary skills at the schools. C) "Caring and Sharing" has been a major topic of discussion at this conference. We see this as the ethical core of these conclusions and recommendations. R) We recommend such an ethical base for the partner-schools and school-networks programmes. United Nations should promote a programme including official ambassadors for the promotion of a culture of peace at schools world-wide. Personal contacts and visits at schools are crucial for motivation among teachers and principals and pupils. A campaign should be initiated in order to bring Ware-fare to an historical end. Schools world-wide could be the starting point for such a campaign. The Life-Link ethics and structure fits very well for an immediate starting of such an historical campaing. We recommend that UN or UNESCO invite organisations working for school-networking to a conference in order to promote collaboration and synergy. We recommend that the Olympic Truce programme should be active at all schools world-wide. Life-Link has experiences in the field of Sport and Peace that can be used for such a campaign. Life-Link has developed a programme with high quality. We will now look for partnership in order to give the programme a wider spread. The Life-Link programme will year 2005-2006 focus on schools within the countries with Arabic culture. The Life-Link programme needs consolidation in several countries, and updating on proposed actions. Special efforts should be given to spread School-Networking in countries still building their "security" on the concept of weapons of mass destruction. Life-Link programme is a Peace Education Programme operating through peace actions within the themes of Care for Myself, Care for Others and Care for Nature. Within the proposed peace actions we actually cover all Culture of Peace domains: Gender perspectives, Democracy, Sustainable biology and social structures, Human Rights (the Rights of the Child), Intercultural understanding and solidarity, Flow of information and free searching of knowledge, International Peace and Security = Common security, "New security thinking". Life-Link also promotes Human Responsibilities - Global Citizenship. The Life-Link approach to the Culture of Peace domains is through the eyes of an individual youth or teacher or parent: how can I as an individual behave in a sustainable manner towards myself? towards others? towards Nature? Schools in more than 60 countries all continents use the Life-Link programme. Some schools are very active, others semi-active in reporting, and some schools might use the programme but with low reporting. Life-Link working with limited staff has to make priorities in promotion, such as regions in post-war situation (Balkan Iraq), regions in democratic development (Eastern Europe).